Half-Life will always be remembered as one of the classics, but even it had its fair share of well-documented development issues. Just six months before the game’s release a new writer, Marc Laidlaw, came onto the project. He thought he’d be just helping polish the game up, but he ended up tearing it wide open to edit and rewrite the entire thing. For more blasts from the past, check out our list of the best old games. 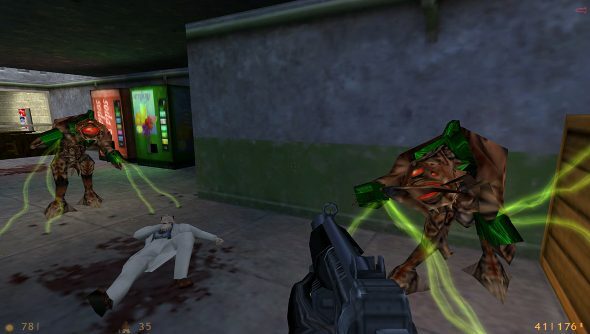 At this point, Half-Life felt like a connection of different ideas, all linked together tenuously. “There was an experimental portal device, several silos, some train tunnels, a nuclear reactor, and endless miles of corridors and air ducts,” Laidlaw explains in a blog post. As a former novelist, he hoped he could do what every writer does when they reach the end of a book: go through again and refine it. But that wasn’t to be, and instead they jammed a crowbar into the game’s inner workings, ripping and tearing bits out that didn’t fit, trying to make the entire thing cohesive. This wasn’t Laidlaw throwing away pages of his own writing, though – he was tasked with ripping out the work of not only writers, but animators, artists, coders and all other games development disciplines, with months of work thrown in the recycle bin. Other story writing techniques were also applied to the game, with later ideas revisited earlier on, like how a novelist might revisit an earlier chapter to sprinkle in some foreshadowing. “One of the cleverer constructions in Xen, our alien dimension, is a series of puckered orifices which swallow you and spit you high into the sky for a lethal fall. These were picked up by one of the other designers and worked back into the terrestrial levels, giving the impression that the earthly plane is being infested by the alien one. Of course, Laidlaw wasn’t responsible for all of this, though he says he did his best to encourage it whenever he could. He also had to keep the vision of the story intact, just as the game’s shifting design killed of crucial story elements. He goes on to explain some other ideas that ended up on the cutting-room floor, where Half-Life was originally planned to be non-linear. or how Valve nearly went for third-person cutscenes. Read the entire thing over on Laidlaw’s blog.